Both authors also outline a method to achieve the goals referenced above. Ms. Kress suggests five key points to create dialogue. First, good dialogue tells the reader “who your character is both intellectually and emotionally.”(p.46) Second, because seventy percent of communication is nonverbal, written dialogue needs to increase the level of emotion with the use of punctuation and narrative. Third, characters’ speech must be consistent, keeping in mind that “[e]vreyone alters his speech for different audiences and circumstances.” (p.53) Fourth, dialect must be written carefully with “the goal…to capture the feel of the nonstandard English by judicious variations of diction, word order, spelling and sentence rhythm, and by moderate use of common phrases.” (p.50) Fifth, characterization can be revealed through what a person says and how much they say. Again, from Moving On A Prairie Romance, when Mrs. Lamb introduces Anna, the main character, to her husband, Herman, this is his response and then his wife’s answer. Mr. Hauge advises answering the following five questions before writing dialogue. Some of the conversations in my novel are ordinary and therefore may not appeal to someone who would like to read about action. Both Kress and Hague agree that writing good dialogue is a balancing act that must be learned through reading authors you admire, and through practice. I’ve learned and continue to learn from reading books about the craft of writing. I hope that you will share with me some of the books you have found helpful through your writing journey. Annette Bower lives and writes in Regina, SK Canada. She is an author of many short stories published in anthologies and magazines in Canada, the United States and the United Kingdom. She explores women in families, women in communities and women at the beginning and end of love and their quest for love. She pursues the writing craft in workshops, conferences, Writing with Style, Banff Centre for the Arts, Victoria School of Writing, Sage Hill Writing Experience, the Surrey International Writing Conferences and the Romance Writing of America Conferences. When she isn’t writing she walks or bikes around the streets and parks in her neighborhood imagining complex worlds behind seemingly ordinary events. Her first contemporary romance, Moving On A Prairie Romance is published by XoXo Publishing™ a division of Ninni Group Inc. Thank you for hosting me on Writers and Authors today. I'm excited to hear readers' and writers' thoughts about creative realistic dialogue. Thank you for hosting Annette today. Thank you for the post Annette. Writing dialogue that has a natural flow to it is an art. Not only does it take the story forward and help with pacing, it also gives unique insight into the characters. Thank you for supplying the sources you quoted from in your article. They definitely sound like great reference books for writers. I agree, good dialogue is an art and as writers we need to continue our education. I wonder what reference books other readers and writers use? Do you have a specific go to book? I don't really have a reference book for dialogue. I prefer to see it in practice and so try to read often and a variety of genres. I'm curious to know what books other writers are using too. Jo, you are right, reading helps a great deal to see how experienced authors use dialogue to move a plot forward and show us character and emotions. At one workshop, I learned that instead of always saying, he said, she said, that the character can do normal things like pick up a glass of water or look out the window, etc. Just the few little clips you have chosen to use here, Annette, show a great deal about Margaret and Herman Lamb. And the one little snippet had me chuckling all over again (I have read and enjoyed the book) and reminded me of another very important function of dialogue, where appropriate. It can add real humor and sparkle to a story. Well done! Thank you, Mary Balogh. As Jo posted earlier I have read some of the best. You have a very subtle way with language in some situations. I can't remember the book but I do remember a woman in a carriage removing her glove which was a sign to the gentleman that she was open to another experience. Great post, Annette - plus wow, what fabulous prizes! Thank you for coming over to Writers and Authors and reading about creative realistic dialogue. You are now entered into the draw. Please excuse me for about six hours. I have to leave on a road trip. I will check and reply to all posts as soon as I arrive at the hotel and set up the internet. But please continue to comment. 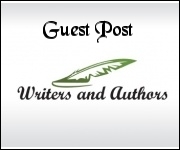 I'm very interested in readers and writers who visit Writers and Authors. I loved the story. It had sensitivity, fun and romance. It also had a town that I would like to live in. Thank you for dropping in at Writers and Authors today. Thank you for your comments about the sensitivity, fun and romance of Nick and Anna's journey. I'm glad that the descriptions of Regina Beach created a place you would like to live. I love fast, snappy dialogue...the kind you get in some of those old screwball comedies, like Bringing Up Baby and His Girl Friday. Like you, I come up with elaborate back stories about people and events in my neighborhood. It's one of the joys of people watching. I've never thought of writing, though. When I first started reading romances they all took place somewhere exotic with people who didn't live in my neighborhood. After I had the opportunity to visit the strange and wonderful places, I found the people are just like my neighborhood and my community. My backyard is fantastic to someone who lives elsewhere. Perhaps one day you will write down your stories and if you do don't be afraid to read reference books as well as other writers. I used to think that if I was meant to be a writer it would just come easily. Perhaps it does for some writers but for me it has been a learning curve with workshops and conferences, and writing. It is an apprenticeship, which I continue working toward being a master, I suppose. Right now another big learning curve is how to reach readers with my virtual book. I appreciate that you have taken the time to read about Moving On-A Prairie Romance and also left me a comment. Good night to all and thank you for finding Jo and I at writers and authors. 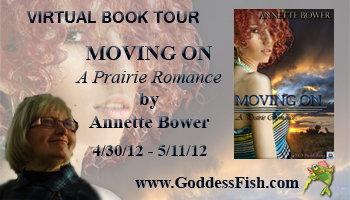 Thank you for coming over to Writers and Authors and commenting on Moving On-A Prairie Romance. This is my last check to add commenters into the draw. Thank you Jo for hosting me on Writers and Authors.